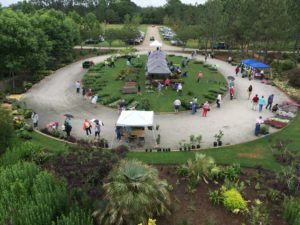 Moore Farms Botanical Garden’s May Days Plant Sale and BBQ is sure to put a spring in your step! For two days in May, the garden is open to everyone for a plant sale, lecture and BBQ lunch. The plant sale will feature many varieties of choice, hard-to-find and unusual plants. Staff horticulturists will be available to assist you with any questions. We only sell what we believe in, so every plant is a winner. Dates: Friday, May 17 and Saturday, May 18 rain or shine! Time: 8AM-3:30PM for self-guided tours of the garden and plant sale both days; 10:30AM lecture on Saturday only. Plant Sale: List will be available in April. Lunch: For only $8 if you preregister and $10 on the day of, there will be a delicious BBQ lunch served from Schoolhouse BBQ. If there are any special dietary restrictions, please contact Leigh Collins at lcollins@moorefarmsbg.org. Proceeds benefit: Organization will be announced soon. Questions? For more information, please contact Leigh Collins at lcollins@moorefarmsbg.org or 843-210-7592.